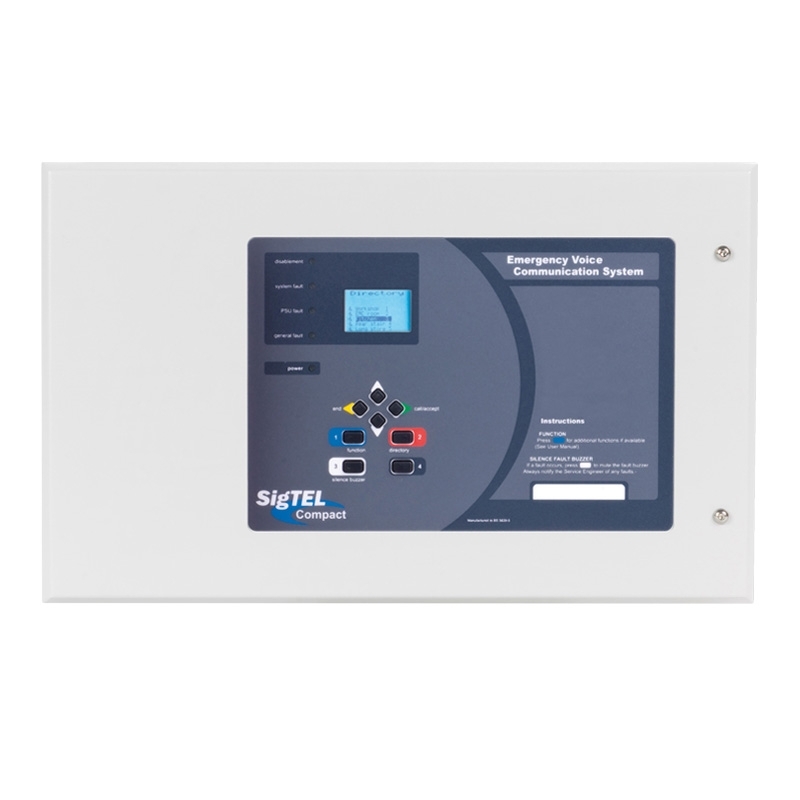 Does not include a handset - ideal for use on networked SigTEL systems that do not require multiple control points. 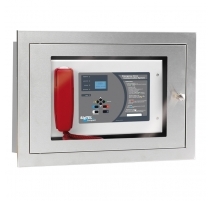 Can be connected to up to eight disabled refuge or fire telephone outstations. 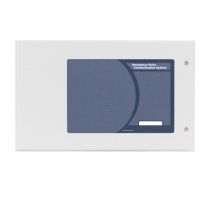 Supplied with a backlit LCD display. 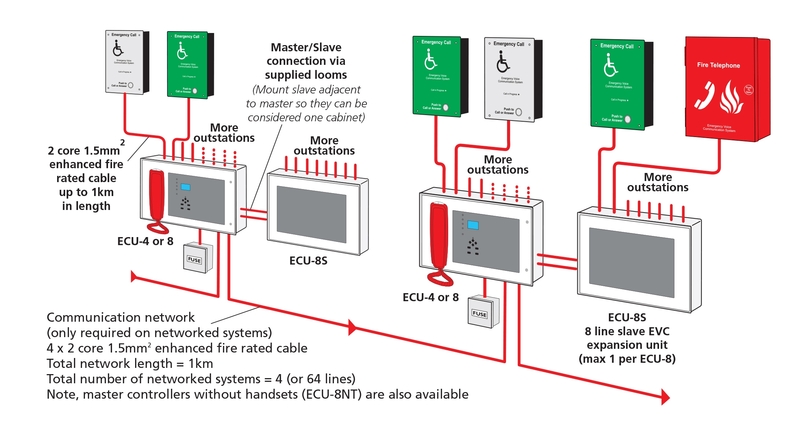 Approvals/certifications Facilitates compliance with BS5839-9 when correctly installed. Quiescent current 100mA (controller with fault buzzer sounding) plus 1mA per Type A outstation and 3.2mA per Type B outstation. No. of lines 8 (expandable to 16 via an ECU-8S 8 line expansion unit). Auxiliary relays Changeover fault relay (failsafe). 30V 1A max. Open collector outputs (OP1): Activates when the ECU is ringing; (OP2) Activates when there is an active accessible toilet alarm call; (OP3) Closes when the handset is off hook and remains active for 2 mins after it is replaced. 24V, 50mA max. Other outputs +24 V. Typically used to supply power to equipment connected to the ECU's open collector outputs (relays, etc). Engineer (AL3) functions Engineer mode and reset buttons (internal). Indicators 128 x 64 pixel LCD display; Disablement; System fault; PSU fault; General fault; Power on. Controls Silence Buzzer. 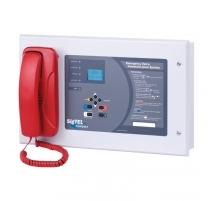 Other controls are available but are not applicable as no handset is provided on this unit. Expansion connections 2 x CAT5 connectors provided for an optional ECU-8S expansion unit (leads supplied with ECU-8S). 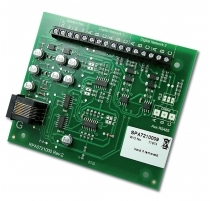 ECU721 network card allows the connection of up to 3 additional ECU-4/8 controllers (1 x ECU721 per ECU-4/8). Construction & finish Metal lid and base, RAL7035 grey texture. 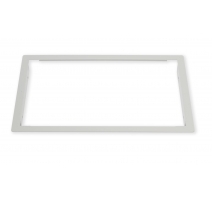 Hole required for semi-flush mounting: 412 W x 255 H x 50 D mm. Requires AFP385 bezel.